Age-related Macular Degeneration (AMD) is an eye disease causing clear vision to fail in millions of older People. Age related Macular Degeneration is traditionally described as a form of the disease which affects individuals over the age of 55 years. However, we have recently discovered that a significant number of these individuals may have a major genetic component that contributes to the disease. There are 2 types of AMD, dry and wet. Dry AMD is more common, causing about 90% of AMD. It can develop so gradually that in the beginning stages you might not notice changes in vision. Wet AMD is less common (about 10% of cases) but is more severe and may progress more rapidly. Dry Macular Degeneration, in which the cells of the macula slowly begin to break down, is diagnosed in 90 percent of the cases. Yellow deposits called "drusen" form under the retina between the retinal pigmented epithelium (RPE) and Bruch’s membrane, which supports the retina. Drusen deposits are "debris" associated with compromised cell metabolism in the RPE and are often the first sign of Macular Degeneration. Eventually, there is a deterioration of the macular regions associated with the drusen deposits resulting in a spotty loss of "straight ahead" vision. Wet Macular Degeneration occurs when abnormal blood vessels grow behind the macula, then bleed. There is a breakdown in Bruch’s membrane, which usually occurs near drusen deposits. This is where the new blood vessel growth occurs (neovascularization). These vessels are very fragile and leak fluid and blood (hence ‘wet’), resulting in scarring of the macula and the potential for rapid, severe damage. "Straight ahead" vision can become distorted or lost entirely in a short period of time, sometimes within days. Wet macular degeneration accounts for approximately 10% of the cases, however it results in 90% of the legal blindness. What does Macular Degeneration do to your vision? Macular degeneration is the imprecise historical name given to that group of diseases that causes sight-sensing cells in the macular zone of the retina to malfunction or lose function and results in debilitating loss of vital central or detail vision. Macular Degeneration can cause different symptoms in different people. Sometimes only one eye loses vision while the other eye continues to see well for many years. The condition may be hardly noticeable in its early stages. But when both eyes are affected, reading and close up work can become difficult. 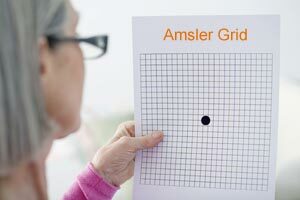 One of the easiest ways to screen for age-related macular degeneration (AMD) is to use an Amsler grid. An Amsler grid is a chart with lines and a dot at the center. Your doctor can give you an Amsler grid to use at home. For dry AMD (age-related macular degeneration), check your vision in each eye every day or as often as your doctor advises. It only takes a few seconds. What can you do if your diagnosed with Macular Degeneration? • Eat a low-fat, low cholesterol diet. • Wear sunglasses with UV protection. • Eat at least two servings of leafy dark green vegetables per day. • Do not smoke and avoid exposure to secondhand smoke. If you are post-menopausal, you should consult with your physician concerning estrogen replacement therapy. This may have a favorable impact upon cholesterol lipid levels that play a role in worsening the disease. Develop healthy habits! If you smoke, QUIT SMOKING! Exercising, maintaining normal blood pressure, cholesterol levels and eating a healthy diet is a step in the right direction. Eat food and-or supplements rich in vitamin E,C and Lutein. Lutein is a plant antioxidant found in high quantities in spinach, kale and other dark green, leafy vegetables. People who eat fish and green leafy vegetables may be at lower risk of AMD. There is no treatment for early dry AMD, although a special combination of supplements (zinc and antioxidant vitamins) may slow progression in some people with more advanced disease. Early intervention for wet AMD can delay progression.